The Bentley Arnage is a very British automobile that offers excellence in both style and performance. 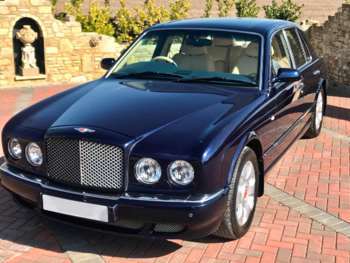 All Bentleys are full of class and sophistication, but to get one for a much lower price, there is a range of used Bentley Arnages for sale at RAC Cars. There have been several variations released over the years meaning there is plenty of choice on the used car market. With a used Bentley Arnage you can expect plenty of equipment, bags of style, maximum comfort and amazing performance. It is an indulgence on a grand scale, with a leather covered interior, hand—finished wood details and all the luxury you would expect from a Bentley. You can also get optional extras such as drink coolers or unique body styles. In fact, Bentley will add almost any refinement you can imagine. The Arnage’s size is only equalled by its power, with a twin-turbocharged 400bhp. Although fuel consumption on a Bentley can be high. The Bentley Arnage is an extremely smooth drive until you turn off the traction control. With 0-60mph in less than 6 seconds and a top speed of 155mph with an almost unnecessarily huge torque spread, it’s magnificent. It has the light steering of an executive saloon, a slick gearbox and the brakes of a sports car. Got a specific Bentley Arnage model in mind?